McCanns taking Times to court? b. It's over that sh*te the Times published about Exxon, etc. Especially bearing in mind that the two journos involved have already cost the Times mega-bucks for inventing stories and smearing people. Re: McCanns taking Times to court? Peter Cruddas, Chief Executive of CMC Markets and former Treasurer of the Conservative Party, has today won a resounding victory against The Sunday Times in his libel action against the newspaper and two of its Insight journalists, Jonathan Calvert and Heidi Blake. The newspaper has been ordered to pay Mr Cruddas £180,000 in damages (including £15,000 for aggravated damages) and his legal costs. This is one of the highest libel awards in recent years and reflects both the seriousness of the allegations and the damage and distress they caused to Mr Cruddas. In a damning judgment of The Sunday Times and the two journalists following a two-week trial, Mr Justice Tugendhat found the newspaper report had been untruthful, misleading, vindictive and malicious in its reporting of a meeting that took place between Mr Cruddas and Jonathan Calvert and Heidi Blake, who had posed as international financiers interested in making a large donation to the Conservative Party. The meeting was covertly filmed and recorded by the journalists with edited clips sent-out to all the major broadcasters on the eve of publication. Interesting. Will wait and see. Are those authors hounders? 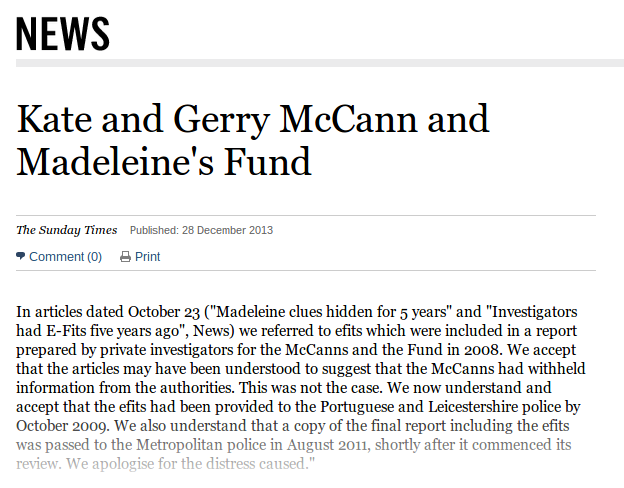 the McCanns never withheld any information, any information that the couple received was sent to those who are actually looking for Madeleine. the one who withheld information (on purpose) was gonçalo amaral when he was aware of information which allowed to find a living child, which were totally ignored by amaral because for amaral it was not good, because with those clues, he would never become a celebrity with dirty fame, that is the truth. I hope the McCanns do sue those authors. They deserve to be. Why? The last court case these two caused the Times was presumably checked, too and look how much money that cost the Times. Small extract from The Times Apology. This more than suggests that they didn't understand when they printed the article, or that they made a malicious statement, or that their research was sadly lacking for some reason or another. Which was it? We all know the fall out on this article which still persists to this day. Barrister. "You now understand? What does that mean? And what did you understand before?" The hounders are now up to their TENTH page of 'speculation'. Bennett's right for once; why idiots keep insisting the McCanns didn't publicize the 'Smith sighting' is a mystery to me. They did, repeatedly, and it's a matter of record. Just who the hell is this Dan Douglas who Morais just happens to have latched onto? Supposedly a former student of journalism who has a blog which picks out odd news articles and comments and who has a single recorded article in main stream media - an article last year in the Guardian which is subject to potential legal action. It is possible that there is some truth in this story, though having read the full apology from the Times I do wonder if the McCanns would need to sue. Only they would know (with their lawyers) what basis they might have for such action. But it is equally possible in my mind that this is some kind of sick or perverted attempt to play online games by Morais and her mates. It is not as though her reputation as a pretend journalist herself makes her reliability something to be trusted or for that matter her choice of 'friends' in the past for that matter. I wonder might somebody look into the background of this blogger and pseudo journalist Dan Douglas. Is he for real because like some of Morais' past contacts he is hardly prolific. I have a suspicion about this. I hope I am wrong and the McCanns are going to sue the backsides off the people who lied about them whether the culprits are news media or online bloggers. I do believe you are right to have suspicions about him, Greenink. No information about him found so far........strange that. lily wrote: I do believe you are right to have suspicions about him, Greenink. No information about him found so far........strange that. There are bits of information but he is not a genuine journalist with a proper career history, that is for sure. 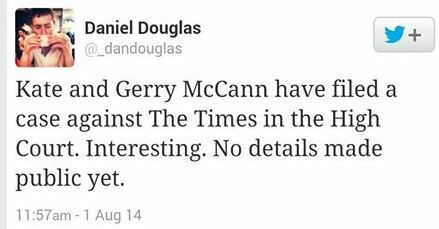 I wouldn't mind the McCanns suing the Times. They deserve it for the lies but I am not going to jump at the chance of it happening based on the word of this blogger who Morais picked up on. Her reputation as a bad judge is legend. I fully expect Amaral, or one of his hangers-on, to pull some attention-seeking stunt about the time the Summers and Swan book comes out. bb1 wrote: I fully expect Amaral, or one of his hangers-on, to pull some attention-seeking stunt about the time the Summers and Swan book comes out. That would be the book which seems to be rooted in sanity and legality rather than Amaral speculation and hounder lunacy. It never ceases to amaze me that the hounders rely on Amaral's ideas as some kind of Gospel when even he calls them theses or speculation. But I am pleased to see this about the upcoming book. "Speculation that the McCanns played a role in their daughter's fate, the authors demonstrate, is unfounded."